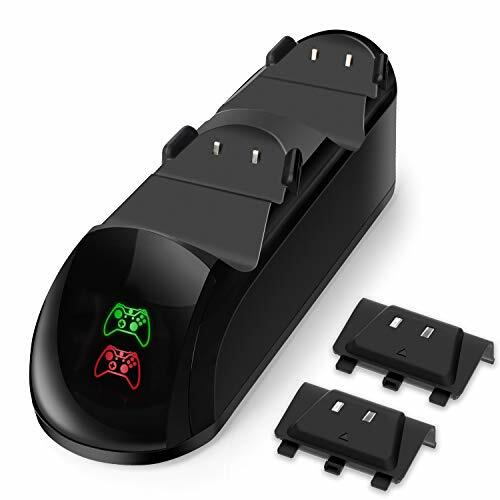 【High Capacity Xbox-One Rechargeable Battery Pack】The xbox one controller charger comes with 2 rechargeable 1200mah NiMH battery packs for high speed fully charging only in 2.5h,providing up to 8-10hours of playing time.No need to wait anymore! Just grab your game controllers and have fun with your friends! 【Perfect Compatibility With Xbox controller charger】This xbox one charging station can store and charge two Xbox One/Xbox One S/Xbox One X wireless controller simultaneously!NOT for Xbox One Elite or Xbox 360 controller. 【Easy to Operate】Just put the equipped controller on the xbox one controller charger dock when not gaming,and then it will begin charging automatically without needing removing battery pack.Red-Charging,Green-Charged. 【Using to Safe】: Replace AA battery turning into rechargeable battery packs. Excellent chip design for over-current/over-voltage/over-heating/short-circuit protection. 【Making Your Choice Right】You will get 1* xbox one controller charger station,2*1200mAh NiMH Xbox One Rechargeable Battery,1*Micro-USB Charging Cable,1*User Manual, Worry-free 12-month Warranty,and 24-hour Friendly After-sale Service.